Apply Rev to self + Apply Guts to self + Apply Blowback (1 square) to enemies at target. + Apply Fear to enemies at target. 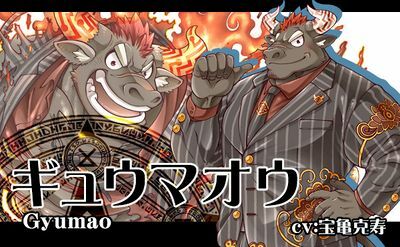 The Rumored Super-Top-Executive, Gyumao-sama is here! Execute the alliance! Now, let's get on with business, Summoner! HAHAHAHA! Well now! Drastic Localization, commence! The true giant trembles! Extreme Expansion, Ultimate Realization! Hmm~ It was quite making a chasm! HAHAHAHA! I will reschedule for now. I'll be back! Many times I've waited for something to happen on my own, but... I'd still like to connect with you as an equal. Is it possible... that I become your private partner? Desert ☆ Journey (8/20/18 ~ ?? ): Tokyo Afterschool Summoners! Be sure to be creative today! President of a venture company headquartered in Roppongi, this Transient once led armies of yokai as a Demon King in the world of Horai. In that time so long ago, his reign was brought to an end by a band of traveling monks. In his own words, "That experience made me the man I am today." He now heads the company with the highest growth rate in Tokyo (relative to the competition), and Gyumao is gradually recovering the lost momentum from his glory days in Horai. However, he has no aspirations toward ruling in this new world, and is strictly a businessman now. Rather than a tyrannical Demon King, he is delighted to be the biggest businessman in Tokyo. 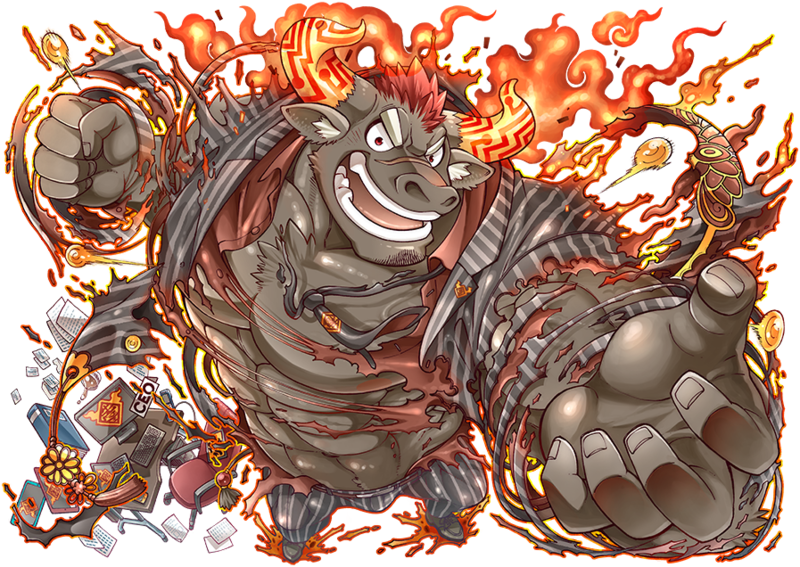 Gyumao's true figure is that of a massive bull that reaches all the way into the clouds. Although his power is restricted in Tokyo, he can access some of it through his Sacred Artifact, his horns. While it is a fraction of his former strength, he is nonetheless capable of destroying a small town if he so desired. He believes the true value of this ability is in presentation and making a lasting impression, and often turns up to conferences and meetings as a giant. Me: "You mess the bull, you get the horns!" Alistar Thinking: "You can't milk those!" This. This hunky beast is the best event character. I feel like he's missing something. Somebody give this man a wrestling singlet. Especially in his 5 star. 5* Gyumao is quite useful. Long Slash AND Infinite Ranged Charge. A beefed up 5* can wipe the enemy team almost immediately. 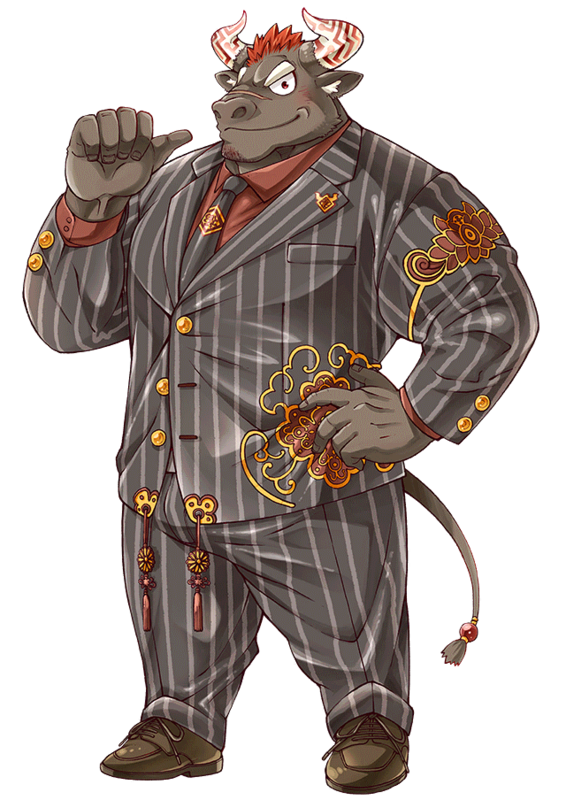 Business man and super hunk bull...... MARRY ME! There's not a whole lot to him. Just try and keep his damage buff up on allies, and hit as many people as possible with his start of phase crit. Anyone with a damage buff for allies is already great, and the fact that he has a crit+ every phase and gets swipe attack just makes him all the better. Somebody can make a guide for Gyumao 5 star ? I want to play him very well. Team,seek and how to play.